What is the overall condition of New Orleans children? We know that by looking at the data, 39 percent of New Orleans children live in poverty – a full 17 percentage points higher than the US average. We also know that the wages of adult workers in a child’s family determine their poverty status. And, while most New Orleans parents are in the workforce, low-wage jobs are all too prevalent. 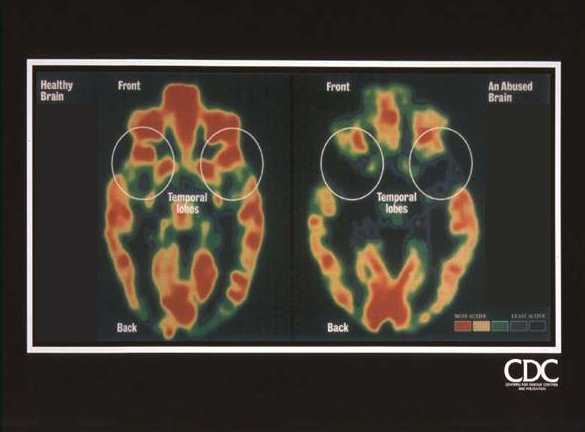 Scientific research shows us that child poverty can lead to increased trauma in young people’s brains and now scholars assert that poverty may be the single greatest threat to children’s healthy brain development. Without healthy brain development, our kids risk lifelong difficulties in learning, memory, and self-regulation. Innovation is needed now to break the cycle of poverty that grips poor families. 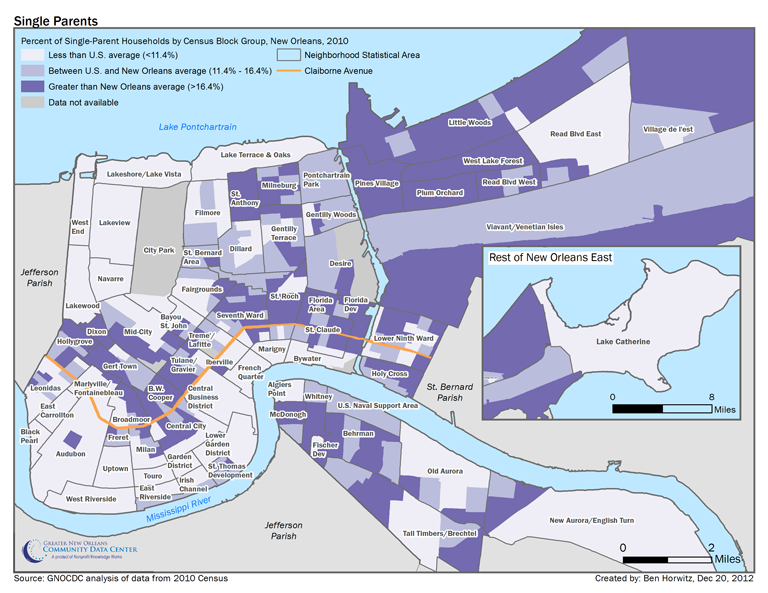 Roughly 78,000 children under 18 years of age live in New Orleans as of 2013. This is a sizable drop from 2000 when over 129,000 children lived in New Orleans.i While the number of children in New Orleans is significantly smaller than pre-Katrina, the poverty rate unfortunately is not. 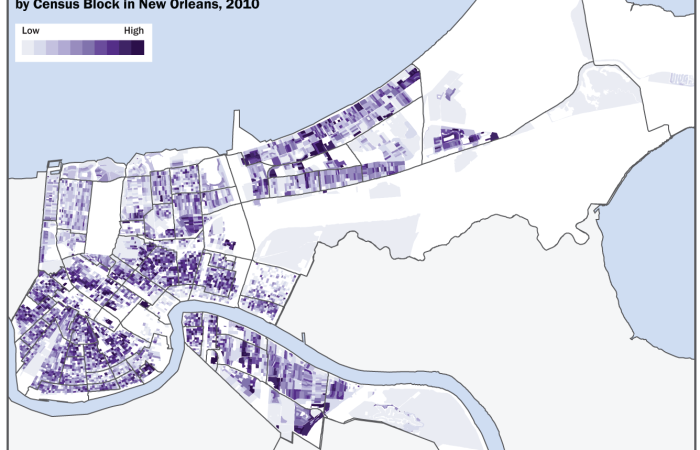 The child poverty rate in New Orleans dropped in 2007 but has since increased to the same level it was pre-Katrina. 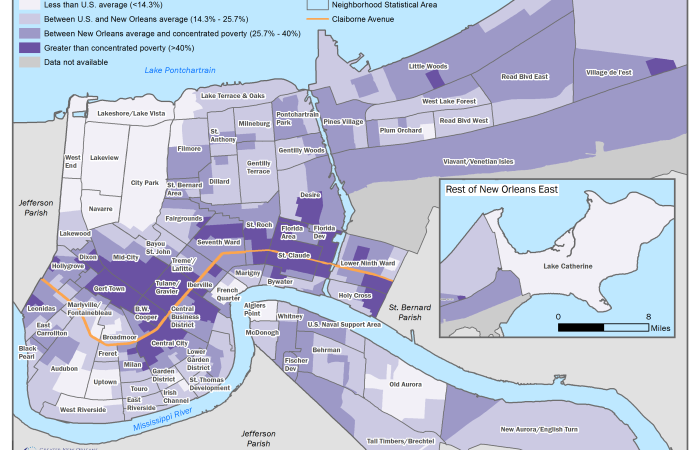 Today, 39 percent of New Orleans children live in poverty. Source: THE DATA CENTER analysis of U.S. Census Bureau data from Census 2000 SF3, the 2007 American Community Survey, and the 2013 American Community Survey 1-Year Estimates. n.s. = On the 1999 bar, n.s. indicates change between 1999 and 2007 is not significant; on the 2007 bar, n.s. 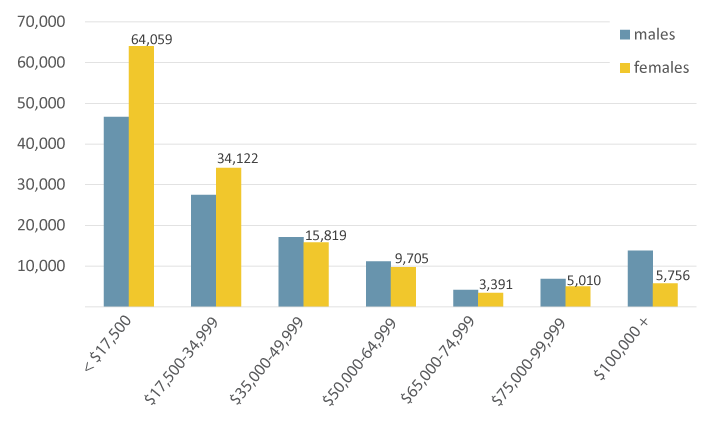 indicates change between 2007 and 2013 is not significant; and on the 2013 bar, n.s. indicates change between 1999 and 2013 is not significant. The child poverty rate in New Orleans is fully 17 percentage points higher than the national average. Moreover, it is higher than in many comparable U.S. cities. 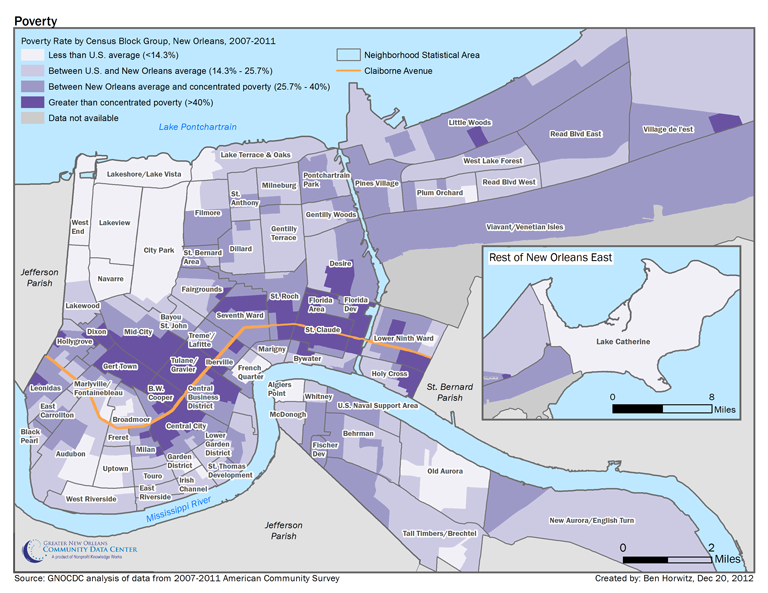 Among the 39 cities with populations between 275,000 and 600,000, New Orleans has the 9th highest child poverty rate. 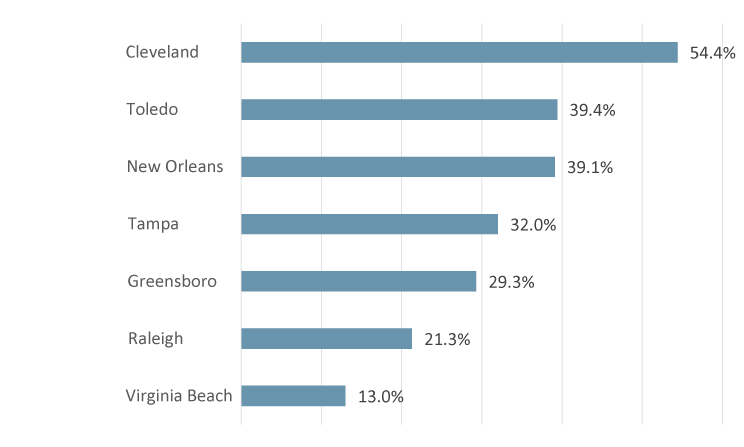 This is particularly concerning given that many of the cities with higher child poverty rates, such as Cleveland, are not experiencing an economic renaissance as in New Orleans.ii Moreover, child poverty in New Orleans is significantly higher than in many cities that New Orleans might aspire to be compared with, such as Tampa and Raleigh. For a complete list of the 39 cities with populations between 275,000 and 600,000 and their child poverty rates, see the downloadable spreadsheet accompanying this brief. By definition, poverty for children is a function of their family’s household income. In other words, the wages of adult family members determine whether children live in poverty. 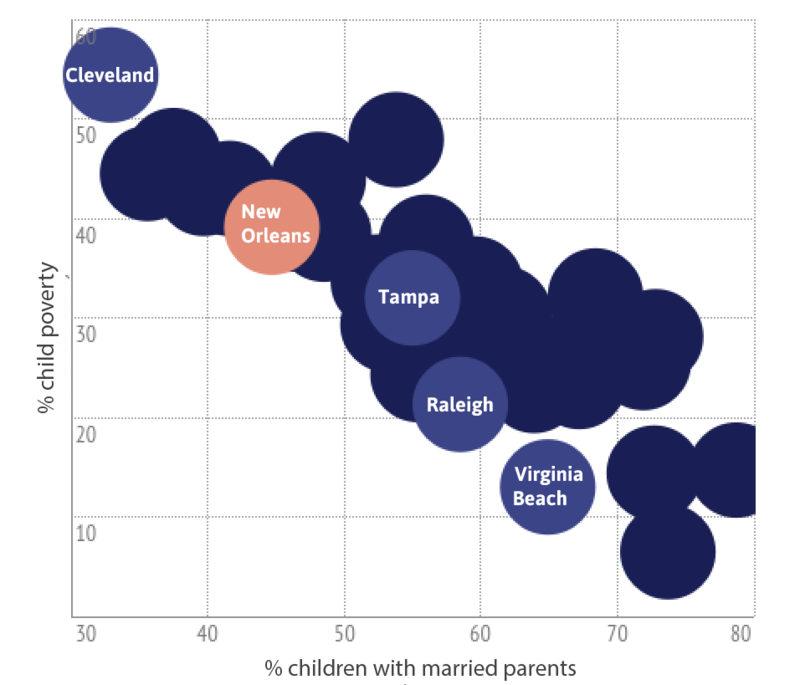 Abundant research shows that family structures themselves are strongly tied to economic standing.iii For example, higher income, well-educated couples are more likely to marry, and to stay married, than low-income couples.iv Thus, in cities with low child poverty rates, children are more likely to be living in married-couple families. Note: The percentage of children living with married parents is from the universe of children living with at least one parent. The universe does not include children who live in households without a parent present, for example, children living with grandparents or other relatives. To explore data about child poverty and married-couple and single-parent families with children in all 39 cities, see the interactive that accompanies this brief. Note: These percents do not include children living in households without a parent present, for example, children living with grandparents or other relatives. Percents may not sum to 100% due to rounding. In New Orleans, the share of children in single-mother families has remained stubbornly high at roughly 48 percent since 2000. While the economic prospects for many mothers and children are not good in New Orleans, marriage is not likely to improve them, given that less than half of all working age, African American men have employment.viii Singer Jesse James’ 1988 song entitled I Can Do Bad By Myself, includes the lyrics, “I can do bad by myself. I don’t need no help to starve to death.” These lyrics may sum up the desirability of marriage for many New Orleans families in poverty. 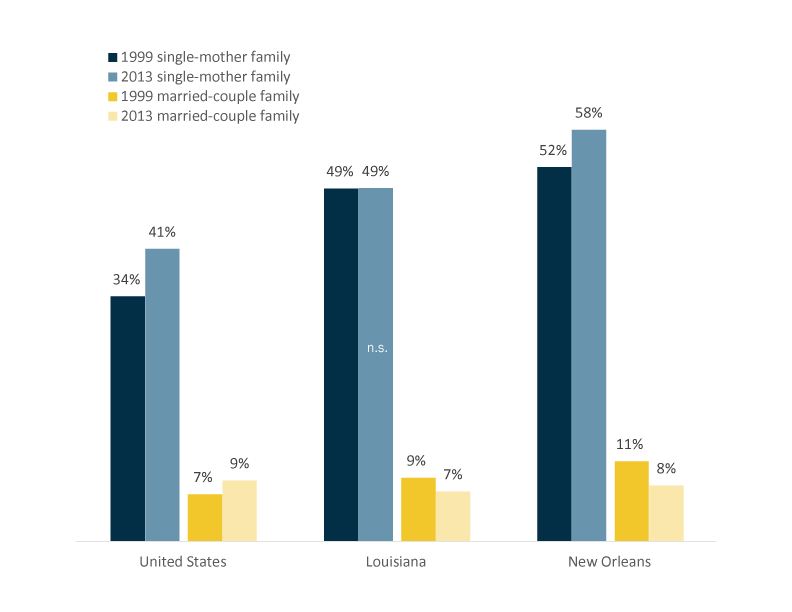 Although overall poverty and child poverty have remained unchanged in New Orleans since 1999, the economic status of married-couple families has improved, while the economic status of single-mother families has worsened. 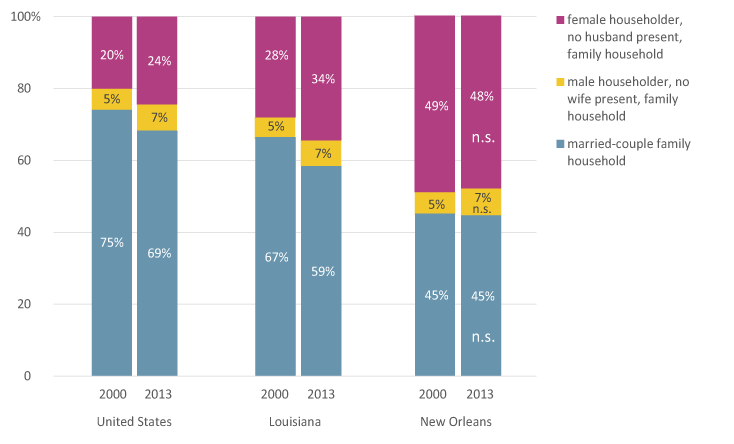 The poverty rate for single-mother households in New Orleans increased from 52 percent in 1999, to 58 percent in 2013, while the poverty rate for married-couples with children fell from 11 percent to 8 percent. All told, the poverty rate for single-mother families in New Orleans—at 58 percent—is much higher than the national average of 41 percent. Despite high poverty rates, single mothers in New Orleans are more likely to be employed than not. All told, 67 percent of New Orleans’ single mothers are working. 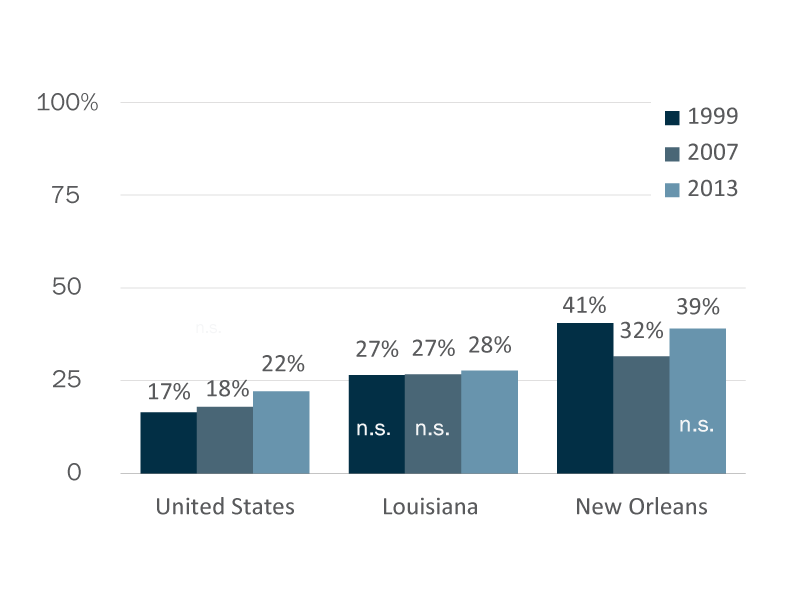 To be sure, all parents of children under 18 in New Orleans are more likely to be working than not. 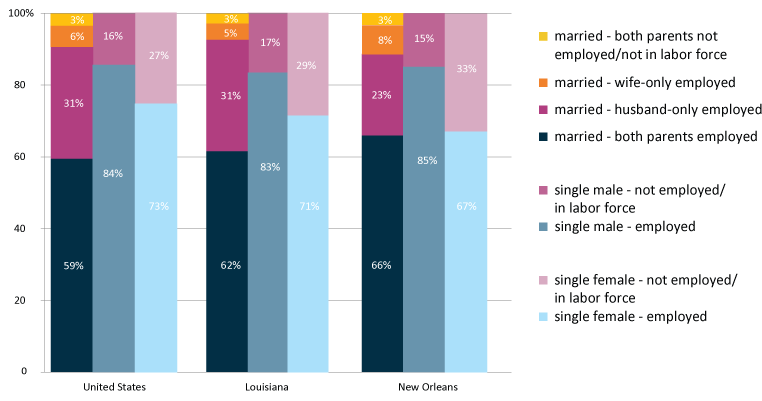 Of all families with children in New Orleans, 82 percent have at least one working parent. And both parents are working in 66 percent of all married-couple families with children. Given that 82 percent of New Orleans families with children have at least one working parent, how could it be that 39 percent of all New Orleans children live in poverty? The answer may lie partially in the large number of low-wage jobs offered in the New Orleans area. A larger share—12 percent—of full-time, year-round workers in the New Orleans metro earn less than $17,500 per year, as compared to only 8 percent nationally. 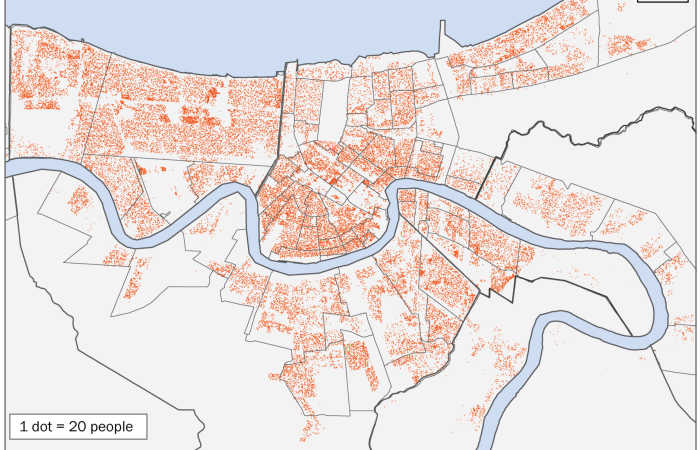 And female workers who live in the city of New Orleans itself are more likely than male workers to earn low wages. According to 2013 Census data, more than 64,000 working women in New Orleans earned less than $17,500 in the prior 12 months through either full-time or part-time work. More than one out of every three children in New Orleans lives in poverty – and this despite the fact that the vast majority of New Orleans children have at least one parent working. If we want to further our progress in building a healthy, prosperous, and resilient post-Katrina New Orleans, leaders will need to focus not only on job creation, but on quality job creation. Jobs must offer reasonable wages, some level of job security, and the prospect of work progression.xiv In addition, the poor need to be connected to those quality jobs. All data is from the Census 2000 Summary File 3 (SF3) and American Community Survey 2007, and 2013 (single-year files). Statistical tests of significance were computed at the 95% confidence level for all data from the American Community Survey and Census 2000 SF3. An “n.s.” indicates that differences between two time periods are not significant, and therefore are the result of sampling variability rather than real change in characteristics of the population. The significance tests require both estimates and their standard errors. Standard errors for the ACS estimates were calculated using formulas in Appendix 3 of “What General Data Users Need to Know” available at: http://www.census.gov/acs/www/Downloads/handbooks/ACSGeneralHandbook.pdf. Standard errors for Census 2000 SF3 data were calculated using formulas from Chapter 8 of the Technical Documentation available at: http://www.census.gov/prod/cen2000/doc/sf3.pdf. Standard errors for Census 2000 and Census 2010 SF1 data are zero. Data on children living with parents by family type, and employment status of parents with children by family type represent only families with a child under 18 years of age who is a son or daughter by birth, stepchild or an adopted child of the householder. Data on poverty status for families with children by type represent families with any child under 18 years of age who is related to the house-holder by birth, marriage, or adoption. The Census’ tabulation of “related” children was selected for the calculation of poverty status to ensure comparability between 2000 and 2013 data. Footnotes can be found in the pdf report, which is available for download on the top right of the page.